Just like the shepherds and wise men, we follow the star to Notting Hill. The Portobello Star that is, which is frequented by ‘Royals, scallywags, urchins, beggars, scarlet ladies, drunkards, intellectuals, popular musicians of the day and the occasional association football player’ – all there to enjoy one of the most misunderstood spirits of all time – gin. Whether it’s the ruin of your mother, the scourge of Hogarth’s Rake, or a ladies beverage to be consumed on a warm summer evening, gin is versatile, and about so much more than just tonic. Inside it’s dark and classy, small tables and green tiles each adorned with beautiful menus that are a literature delight in themselves. Based on Jerry Thomas’ Bartenders Guide, one of the first published cocktail books, they contain humorous, historical and detailed descriptions of each drink. Alongside the classics are Ginstitute favourites, forgotten tipples and contemporary twists including The Slutty Mermaid, Katy Peri Peri and The Guinness Punch. Whilst it’s a fantastic bar in itself, we’re here for The Ginstitute Masterclass, where we’re going to learn the history and mastery behind gin cocktails. 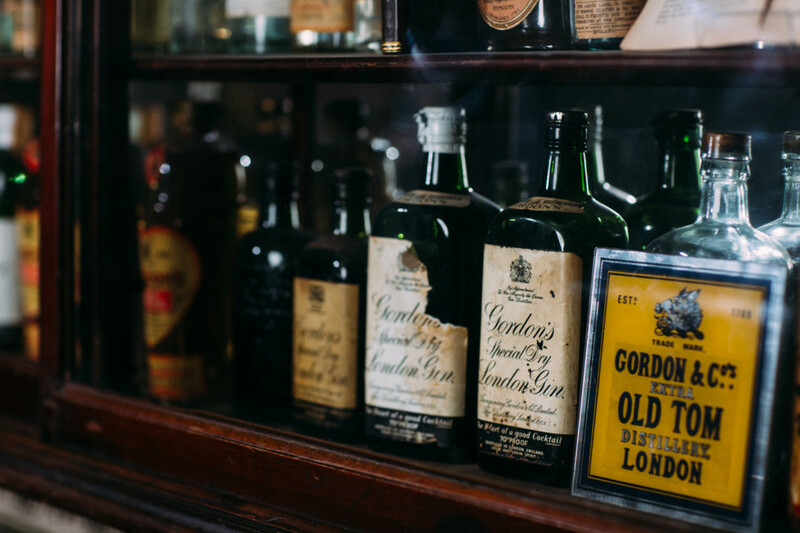 Four of us gather together upstairs in the candle lit still room filled with dark wood cabinets displaying collectible bottles, vintage adverts and memorabilia and are guided through an evening of classy drinking by two of the Ginstitute’s experts. Each drink is introduced with a brief history and some dispelling of myths (gin doesn’t prevent malaria – to get the anti malarial benefits from quinine you’d have to drink twelve litres of the stuff; gin doesn’t make you miserable and subject to vice, just at the time of the gin craze when poverty, deprivation and health in England was so poor, gin happened to be cheaper than beer and cleaner than wine, so the 10 litres per capita being consumed was an easy scapegoat; are cocktails really named after the practice of shoving ginger up a horse’s arse?). We’re then each given the opportunity to create it, guided by the bartender and with a willing group of drinkers eager to taste test. In just under an hour, we mix and drink a Tom Collins, Classic Dry Martini, The Clover Club, Negroni, The Bramble, Sweet Martini, Cosmopolitan and Gin & Tonic. Yes, even the classic G&T is epic, made with nine botanical Portobello Road gin, Fever Tree tonic water, juniper berries and grapefruit – and tons of ice. Another myth dispelled – this doesn’t water it down: the more ice you use the slower it melts. At £60 per person it seemed steep, until you factor in that you end up with 9 cocktails each, including your welcome gin and tonic downstairs. By the time we leave, I can’t do the maths, but we feel quids in. Educated, entertained, and more than a bit merry. Mother’s ruin? Nah, not if you do it The Ginstitute way.